Drinking fruit juice dramatically reduces the effectiveness of drugs used to treat cancer, heart conditions and high blood pressure. Research has shown that orange, apple, and grapefruit juice can also wipe out the benefits of some antibiotics and hayfever pills. It is thought the drinks stop drugs from entering the bloodstream and getting to work in the body – possibly rendering them useless. The potential effects are so serious, researchers warned, that if in doubt, patients should swap fruit juices for water or another alternative when on medication. Researchers stated that: ‘This is just the tip of the iceberg. I’m sure we’ll find more and more drugs that are affected this way.’ Twenty years ago, it was shown that grapefruit juice dangerously magnifies the effect of the blood pressure drug felodipine. Their findings led to warnings that the drink should be avoided by those on some medicines. The latest study shows that fruit juices can also reduce the power of medicines – potentially stopping them from doing any good. Drugs shown to be weakened by grapefruit, orange and apple juices include the blood pressure-lowering beta blockers atenolol, celiprolol, and talinolol and the hayfever treatment fexofenadine. The multi-purpose antibiotic ciprofloxacin used to combat germs behind food poisoning and bone and joint infections, is also affected. So are the cancer drug etoposide and a drug given to prevent the rejection of transplanted organs. Many other drugs are also likely to be affected. The study showed juices do not need to be taken at the same time as drugs to have a dangerous effect. Those drunk up to two hours before can reduce drug absorption. But patients need not stop drinking juice altogether. Juice taken four hours prior to drug intake did not have an effect. Thus, it should be possible still to take grapefruit, orange, and apple juices while on affected medications provided there is a sufficient time interval. Normal advice is to take medicinal drugs with water on an empty stomach to get the most consistent effect. Anyone on medication should be advised to speak to their doctor or pharmacist before taking fruit juice with medicines. The link between medicinal drugs and certain fruit juices was made after volunteers in a study were asked to take the hay fever drug fexofenadine at the same time as either a glass of water or grapefruit juice. Taking it with juice cut its absorption into the bloodstream by half. Experiments showed naringin, the chemical which makes grapefruit taste bitter, blocked the drug from moving from the small intestine into the bloodstream. Researchers have pinpointed a naringin-like compound in orange juice and are looking for a similar one in apples. A different mechanism is at play with the drugs whose levels are boosted by grapefruit juice. There, juice deactivates a liver enzyme that breaks down drugs, making normal doses potential overdoses. The study is not the first to highlight the dangers behind supposedly healthy juices. 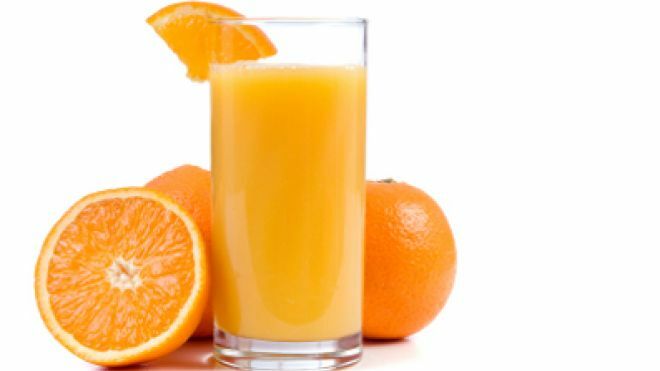 Research from Harvard Medical School in the U.S. showed that one glass of orange juice a day can increase the risk of a form of diabetes linked to poor diet and obesity. But eating whole pieces of fruit cuts the likelihood of developing the disease. It is thought the lack of fibre in juices may cause spikes in blood sugar levels.